installed, GT Glass has quality & experience you can trust. GT Glass was established in 2008 by Greg & Trish Holst as a small business out of our garage with just one employee. Our business has evolved into a 4000 square foot shop/showroom in Saskatoon’s north end with eight employees. Greg has been in the construction industry for over thirty years. His attention to detail, vision, and sense of style show in the quality of the finished product. Trish has many years of business experience and keeps the office running with her warm and friendly attitude. GT Glass has now been in business for over 10 years. We still pride ourselves on exceptional customer service and strive to give all our customers the benefit of our years of experience in the construction industry. From Saskatoon and area home builders to contractors to ‘do-it-yourselfers’, all of our customers receive the same personal attention from the first phone call to the completion of the installation. We work with quality suppliers to provide you with the highest standard products. If we wouldn’t install it in our house, we won’t install it in yours! With a team of 4 experienced installers, your project is completed to exacting standards, and on time! We promise quick replies to your phone calls and emails, and timely warranty response. Protect your investment (and save yourself time!) with the latest in protective coatings that help cut down on water marks and scaling. With our years of expertise, we can help you find the perfect solution and unique design for your project. Contact us for any custom glass project – including wine rooms, gym doors, glass railings, partition walls and more! Custom, Framed, or Frameless – We do them all! With our large inventory selection, we can get most standard sized shower doors manufactured and installed within a week. We custom cut your mirror and finish with a machined edge for that polished look. Full wall mirrors are a great option for dance studios and gyms. Bevelled mirrors are also available in standard and custom sizes and shapes. We provide railing glass, backsplashes, doors and walls for your office, wine rooms, gym doors, and more! We also offer a selection of standard glass shelves, or we can custom make to suit your project. We like to start with a quick discussion (either over the phone or in our showroom) to determine the type of product you are looking for. That way we can give you a general quote to assist you in budgeting. An on-site measure/consultation is the next step. We set up an appointment and have one of our experts meet with you. That way we can get precise measurements, offer possible suggestions and troubleshoot any potential issues. Once we have the measurements, placing your order is as simple as confirming the quote and providing us with the required deposit. Installation usually takes place within 3 to 4 weeks of placing the order (for custom orders) or within 1 week for items we have in stock. Soroski Homes Ltd. has had the pleasure of working with GT Glass on several projects over the last number of years. GT Glass has proven to be very professional, responsible and reliable in their dealings with us. We have also recommended their services to friends and have always received very positive feedback in regards to their work. 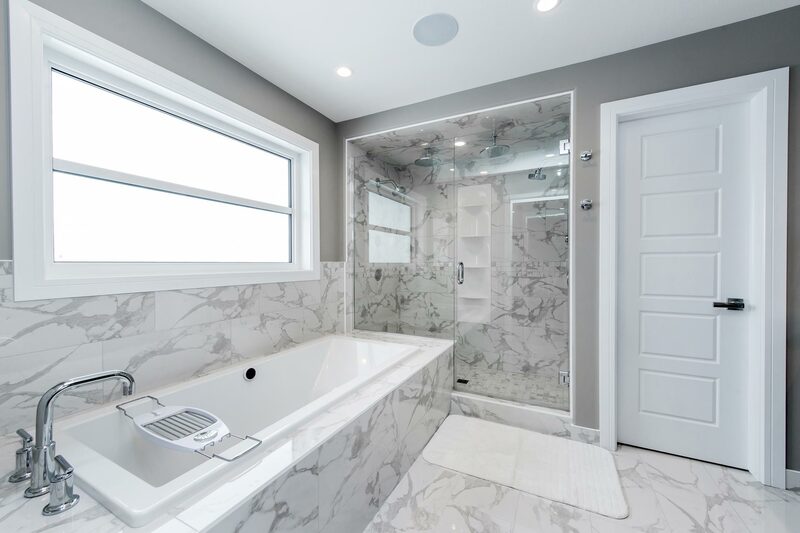 It is without reservation that we highly recommend them for any shower door, glass or mirror needs that you may have.- Jim at Soroski Homes Ltd.
Find information to the most commonly asked questions regarding your new shower door or custom glass. For additional information, or for assistance regarding your specific product, please contact us directly by phone, email or the contact form below and we will respond to you as soon as possible. GT Glass suggests the following for proper cleaning and care of your shower door enclosure. Squeegeeing the glass frequently, then drying with a soft cloth is highly recommended. Using a squeegee after each shower helps keep spots and scale from accumulating on glass components. We also follow the recommendation of the Bath Enclosure Manufacturing Association (BEMA). You should avoid abrasives, bleach, acidic or vinegar-based cleaners and scrubbing pads. Read labels on cleaning products thoroughly before using. If your glass is coated or treated with surface protectants, see the PDF below for instructions. To conform to building codes, shower doors must use tempered glass. Building codes specify tempered glass due to its safety properties. Tempered glass is four to six times stronger than un-tempered (or annealed) glass. In the rare event of breakage, however, the tempering process causes the glass to break into smaller, lighter, less jagged pieces. Due to these benefits, automobile side and rear windows and many household windows and doors utilize tempered glass. The edges of tempered glass are the most vulnerable area that cause breakage. For this reason, ensure that when the door is swinging or sliding that it does not hit something hard or sharp, such as a toilet, towel rack, sink, or any moveable hard objects, etc. Also ensure the glass door does not swing or slide into unprotected metal components of the shower door itself. If the door hits another unprotected part, it may indicate shifting or settling of the house, an improper installation, or any other situation that requires attention. Call GT Glass immediately to have the problem corrected. In the event of breakage, contact GT Glass for replacement and refer to the Lifetime Warranty. There is a saying in the shower door industry, “A shower door is not an aquarium.” Further, different models of shower doors provide different levels of water protection and proper installation plays a large role in achieving proper functioning. While GT Glass engineers its products to provide a high level of water protection and offers accessories to enhance protection for smaller enclosures or high water pressure/volume situations, there is always a possibility of water dripping onto the floor. Besides providing anti-slip protection, bath mats are a common solution if minor issues exist. *This includes silver, gold, brushed nickel, satin silver and some oil-rubbed bronze/dark bronze. Aluminum is a lightweight, non-rusting metal which is anodized to give colour and to make it shiny. Anodizing also seals the aluminum to guard against corrosion and pitting. Electroplating is a process similar to anodizing. Some glass and lime scale cleaners can damage anodizing and electroplating, causing pitting or discolouration. You can permanently damage the metal’s finish if improper cleaning compounds containing alkaline and phosphoric acids are used. The result can be the appearance of white spots and discolouration. Many products’ labels warn against use on anodized and plated metals. Read labels on cleaning products thoroughly before using on your shower door. Drywall, spackle and tile grout, which contain lime, can also spot metal and glass surfaces. *This includes oil-rubbed bronze, white, black, etc. The powder-coat surface is very durable, but it can scratch or chip. If a scratch occurs, please seal it with a matching paint from your local paint or big box store or clear fingernail polish. Guidance for cleaning powder-coated metal is the same as anodized/electroplated metal. GT Glass commits to a 12 month product and workmanship warranty (from the date of substantial completion) that will cover any manufacturing or installation defect at no additional cost. During that time, we will repair or replace (at our option), any hardware or glass installed by us found to be defective in material or workmanship. From 12 months to 36 months, if there is a manufacturing defect in the hardware or glass, GT Glass will cover the cost of the replacement. This extended warranty period covers parts only, labour is not included. This warranty does not include normal wear and tear, or product abuse. This warranty applies to all shower doors, glass railing, interior glass doors, glass wall partitions, and mirrors, as well as any hardware that we provide for any of these applications. This warranty applies to the original purchaser and is not transferable. There are no other warranties expressed or implied and the manufacturer will not be responsible for consequential damage arising as a result of defects or otherwise. GT Glass is committed to providing the highest product quality and installation service. We pride ourselves in our attention to detail and offer prompt, reliable, knowledgeable and friendly customer service. We expect to exceed your expectation in your dealings with us. Come visit our showroom to talk about your shower door and custom glass needs! You can also fill out the form below and we will get back to you as soon as possible.